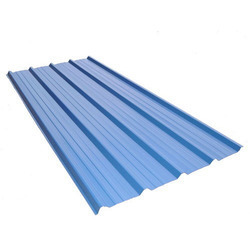 The buildings sheets are available in Trapezoidal shape, and can be offered in desired thickness from 0.40mm (28-G) to 1.00mm (20G) in desired lengths and variety of colors. Our company is a prime manufacturer and supplier of an excellent assortment of Curved Roofing And Cladding. We offer Klippon steel cladding which is designed to be screwed on to roof Purlins or wall grids with fixing clips. These are out of sight during fixing and do not require any fixing holes through the steel sheets. Hi-Rib profiles is 1020mm wide coverage with 28-30 mm deep ribs at 200-250mm centre to centre with two/three stiffeners in between the rib. Hi-Rib profile incorporates male/female ends with fill return leg and anti-capillary flute at side-lap thus ensuring leak proof sheeting capable of efficient water drain out. We have carved a niche amongst the most trusted names in this business, engaged in offering a comprehensive range of Cladding Sheet.